Definition at line 134 of file readable.c. Relative chance of the message appearing randomly. If 0 will never appear. Definition at line 135 of file readable.c. 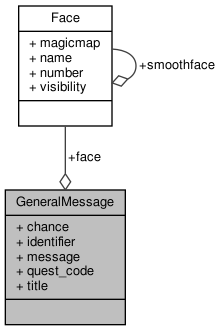 Face the message displays at in the knowledge dialog, -1 if no face defined. Definition at line 141 of file readable.c. Referenced by get_message_face(), and init_msgfile(). Message identifier, can be NULL. Definition at line 137 of file readable.c. Referenced by free_all_readable(), get_message_from_identifier(), init_msgfile(), and msgfile_msg(). Definition at line 139 of file readable.c. Referenced by free_all_readable(), get_message_body(), init_msgfile(), and msgfile_msg(). Next message in the list. Definition at line 142 of file readable.c. Optional quest code and state this message will start. Definition at line 140 of file readable.c. Referenced by free_all_readable(), init_msgfile(), and msgfile_msg(). The message's title, only used for knowledge. Definition at line 138 of file readable.c. Referenced by free_all_readable(), get_message_title(), and init_msgfile().